Item shown above : Black Finish, in side profile. (Cards not included). The picture speaks for itself. Unmatched quality. This display case holds 36 graded or 48 non-graded cards. Carefully crafted from selected hardwood. Beveled shelves to prevent the card from sliding. Repeated sanded to achieve smooth and elegant appearance. 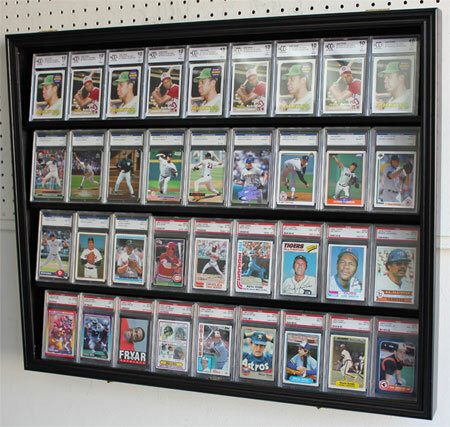 A great way to showcase MLB baseball cards, NBA basketball cards and NFL Football cards. Super fine fabric matted background (Black) creates a fancy and elegant contrast. Acrylic door cover to protect from dust and damage. Brass hinges, door latches, and wall brackets to hang (Wall mounted). Door with Lock. No assembly required.